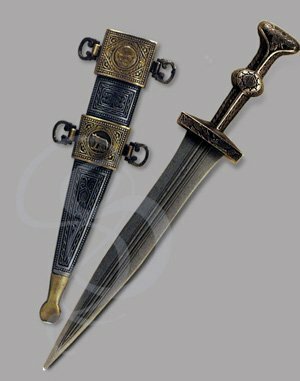 Roman soldiers loved their shield and gladius, but when the fighting got personal, the pugio dagger was always their emergency choice. Short, wide-bladed and tough, the pugio (not to be confused with the French car company Peugot) was often engraved or gilded, particularly among the officers. legionnaires, who always wore their gladius on the right, wore the pugio on their left side. Officers and non-rank soldiers wore the pugio on their right. Contrary to popular belief, pugilists never used pugios. That would have been repugnant. And pugnacious. This particular pugio is a reproduction of an actual roman pugio that was unearthed in Italy. It's engraved meticulously along almost every inch of the scabbard and much of the hilt, perhaps indicating that the original owner was a high-ranking officer or wealthy citizen. 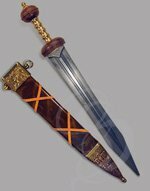 The classic, thick and waisted blade is grooved on both sides of the spine, as was common back then. These grooves provided structural support to the blade (believe it or not) and made the sword much stronger. The hilt on this dagger features a dazzling array of engravings, from sun symbols to the Roman eagle. The typically short and rectangular guard features an abstract eagle with wings spread, flanked by ornate rondels and ivy patterns. The grip swells at the center for a better grasp and is gilded with a sun at the midpoint and a striking Roman eagle at the pommel. This classic pugio blends the magnificent opulence of the Roman empire with the savage warrior philosophy of it's soldiers, and throws in a dash of spaghetti and meatballs just because. (I have no idea what I mean by that, but it sounded right at the time. Infer any type of appropriate metaphors or symbolism that you feel might apply). An absolute must-have addition for any Roman costume, and a stunning conversation piece in any room. Material: Cast from a metal alloy with various types of metals used for the ornate gilding on the scabbard and hilt. Blade is made from an alloy that cannot be sharpened, making this a very safe reproduction.